This property is associated with the initial period (1902-1920) of downtown commercial expansion that occurred due to local economic prosperity after the Klondike Gold Rush and in tandem with explosive population growth and suburban residential development. During this era, modern urban architectural scale began with the construction of the earliest steel-frame highrise buildings and the establishment of a concentration of banking enterprises and department stores along Second Avenue from Cherry Street to Pike Street. The initial regrading of Denny Hill and the commercial redevelopment of the former University Grounds (University/Metropolitan Tract) were major factors that facilitated northward and eastward commercial expansion. In 1914, the owners of the Frederick and Nelson Department Store purchased property with the intention of building a large, five-story store at Fifth Avenue and Pine Street, thus solidifying the location of the future downtown retail core. A significant number of extant commercial properties dating from this era remain within the downtown commercial core, including: numerous hotels, banks, business blocks and early highrise commercial buildings, as well as some specialty and department stores, clubhouses, apartment houses and theaters. During the late nineteenth century banking enterprises were typically small and housed at the storefront level - often as a prominent corner tenant - of a large commercial business block. As banking businesses were consolidated and grew into larger financial institutions, they began to be housed entirely within smaller business blocks constructed for and owned by the banking enterprise. Individual bank buildings were most often designed in a neoclassical mode conveying stability and permanence and included ornate interior finishes and design features. 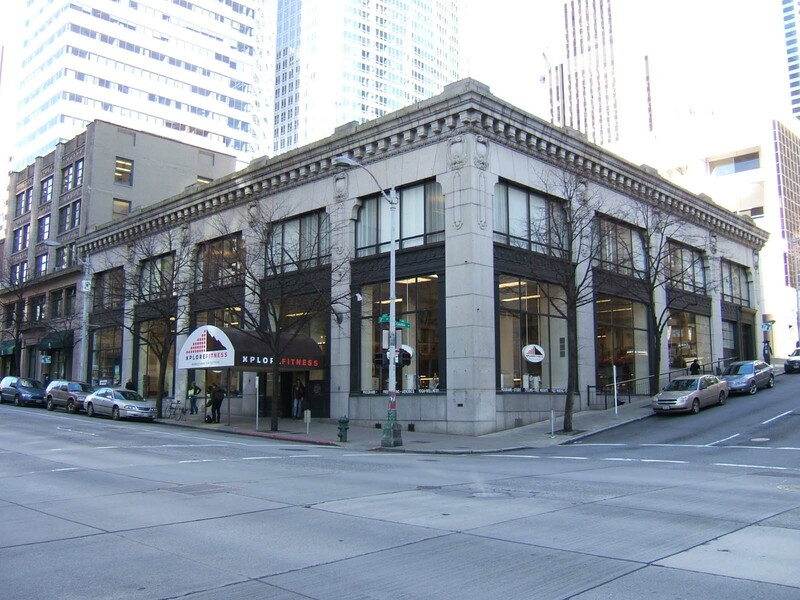 During the post-fire era and the earliest years of the twentieth century, the headquarters of the major banking enterprises were clustered near First Avenue and Yesler Way or along the southern end of Second Avenue near Yesler Way. However, by 1912 nearly all of the major banks and financial institutions were headquartered at locations along Second Avenue near Marion and Madison Streets. By the mid-1920s, the financial district was well-established at this location as banks and other financial institutions continued to construct or occupy portions of large commercial office buildings as well as smaller scale buildings devoted entirely to banking operations, including; the Scandinavian American Bank (Alaska Building, 1904); Seattle Trust and Savings Bank (1903, 1922); Seattle National Bank (1921); National Bank of Commerce (Baillargeon Building, remodeled 1918); Union Savings and Trust Co. (Hoge Building, 1911); the Dexter Horton (later Seattle First National Bank) Building (1922); and the Bank of California (1923-24). This Seattle Trust & Savings Bank building was initially built and expanded 1903-06 and financed in part by Herman Chapin of the Boston Company for the Boston National Bank, for which he served as president. The bank building was designed by Boone & Corner; at the time W.E. Boone was one of Seattle’s longest practicing architects. Shortly after the initiation of construction, Seattle National Bank merged with the Boston National Bank and subsequently moved to that firms’ location at NW corner of Second Avenue and Columbia Street, and thereafter the building was known as Seattle National Bank. The combined deposits exceeded $3 million making it the third largest bank in town, after the Dexter Horton Bank and the Puget Sound National Bank. In 1910, Seattle National and Puget Sound National merged, thus eclipsing Dexter Horton Bank. The enlarged Seattle National Bank remained the largest commercial banking institution in Seattle until 1924. However, by 1920 Seattle National Bank had outgrown it quarters and commissioned the Northwest’s premier designer of banking halls, A.E. Doyle of Doyle & Merriam, to create an appropriate new building at the SW corner of Second Avenue and Columbia Street. [Note: In the great merger of 1929, Seattle National, Dexter Horton, and the First National Bank group combined to form Seattle First National Bank, long the principal local bank until it became part of Bank of America.] The original architects of the building, William E. Boone (1830-1921) and James M. Corner (1862-1919), formed a partnership in 1900, which lasted until 1905. Boone’s prolific career in Seattle began around 1882 and he retired from architecture in 1910. He had an established practice prior to the fire of 1889 and was subsequently a partner in several successful firms after the fire, a rarity among the architects who contributed to the rebuilding and expansion of the post-fire commercial district. W.E. Boone was born in Pennsylvania in 1830, and according to his obituary, was a direct descendant of Daniel Boone. He was responsible for the design of many pre- and post-fire buildings in the commercial district, including: the Yesler-Leary Building (1882-83, destroyed in fire), the Merchant’s Café Building (Sanderson Block, 1889-90) and the Globe Building (Marshal-Walker Building, 1890-91). In partnership with William H. Willcox, his work included the New York Block (1889-1892, destroyed) - considered a premier office building - at the northeast corner of Second Avenue and Cherry Street and the original four floors of the J.M. Frink Building (Washington Iron Works Building/Washington Shoe Building, 1891-92). His subsequent partnership with James Corner (who had previously practiced in partnership with Warren Skillings) produced the subject building as well as the first Seattle High School (Broadway High School, 1902-03 destroyed), the Cyrus Walker Block (1903, destroyed). Thus, in 1922 the former Seattle National Bank was remodeled to serve another banking institution, the First National Bank. The design for the remodel was also prepared by Doyle & Merriam. The interior was subsequently remodeled again in 1929, reportedly with a design created by John Graham, Sr. After the great merger of 1929, the building was used by Seattle First National Bank. Seattle Trust and Savings established its headquarters here in 1934, purchased the building in 1940 and became its longest lasting bank occupant. Additional interior alterations (and some exterior changes) have been undertaken repeatedly since the 1950s. Only a small portion of the ornate banking hall is now visible to the public. Despite these alterations, the 1906 building exterior is relatively well- preserved. Furthermore, it is an early and notable example of bank design from this era and is associated with the career of a highly important Seattle architect, William E. Boone. Located at the sloping NE corner of Second Avenue and Columbia Street, this two-story building was designed to serve as a bank and is now used for commercial and retail purposes. It measures 120’ x 108’ and includes a reinforced concrete basement. It exhibits an arcaded block façade composition and incorporates classically derived architectural details and features. The reinforced concrete structure is clad with smooth light color granite (with subtle vitrified highlights) and the exterior is distinguished by prominent two-story structural/window bay openings. The primary Second Avenue elevation is divided by five, two-story bays and the Columbia Street elevation by four similar bays. The granite clad openings have a shoulder angle and in combination create an arcaded façade feature. Each inset window opening is divided horizontally at the second floor level by a dark cast-iron spandrel supported by fluted cast-iron pilasters that frame the tall first floor level windows. The spandrels are decorated with classical motifs. The upper portion of each pier is decorated by an elongated raised panel and surmounted by a large cartouche. The building is capped by a cornice comprised of egg-and-dart moulding, heavy modillions and a coved crown moulding. The large wooden windows at the first floor level and the modern aluminum windows at the second floor level are not original. A large modern canopy has been added to the front entryway. The original/historic interior spaces and finishes have been altered and remodeled several times. Marble flooring as well as limited portions of marble wainscot and decorated column capitals are currently visible within the interior. There do not appear to be any remaining intact or architecturally significant public spaces.